Cadillac Unveils Wreathless ATS Sedan! Caddy's new badge officially launched. 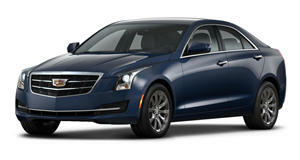 Without a modicum of fanfare, Cadillac has unveiled the first batch of official images of the 2015 ATS Sedan – with the recently facelifted model wearing the carmaker’s redesigned wreathless crest. Minor updates to the 2015 model include two new colors – Crystal White Tricoat and Dark Adriatic Blue Metallic – and a modestly revised cabin that receives new upholstery and trim combinations as well as additional safety and tech features such as Siri Eyes Free and a Teen Driver function. Engine options are unchanged with buyers offered a 202-hp 2.5-liter four-pot, a 272-hp 2.0-liter turbo four, and a 321-hp 3.6-liter V6.